Blue Raster has contributed an ArcGIS Server Flex API application for the World Wildlife Fund to support the Climate Change LEADS: Linking Environmental Analysis to Decision Support project. 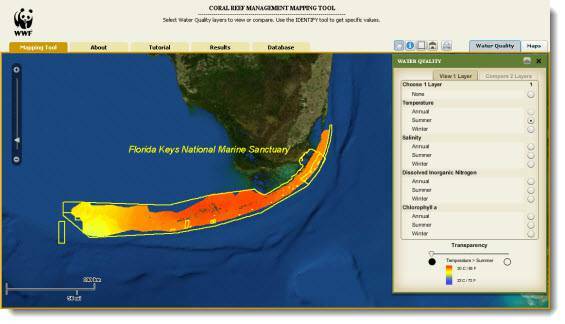 The tool allows users to explore water quality patterns throughout the Florida Keys National Marine Sanctuary. These results are based on quantitative landscape ecology and GIS techniques using existing and emerging data to perform an analysis of the spatial and temporal relationships between environmental factors and coral bleaching response to suggest patterns of resilience within the Florida Keys National Marine Sanctuary. This is very specific to the Keys, but the scientific concepts if applied world-wide would provide one of the few “global” (near-shore environments) data sets and analytical capabilities.